This is a custom Word Press web site for Greenville Pest Control located in the Greenville SC. The site has iconic bug scrolling linking to a pest control information center. The home page and interior pages feature focus box graphics for the 3 primary service areas. 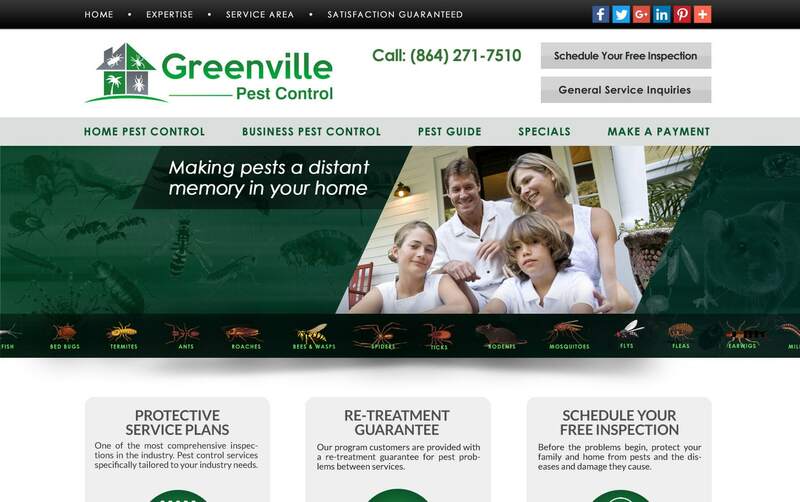 This recent web design Greenville SC project for Greenville Pest Control provides a branded website presence in a highly competitive space. Pest control business coast to coast choose VISIONEFX. We also provide website repair and maintenance plans to keep your website up and running smoothly. We make sure you are receiving your incoming leads and inquiries. Expert hosting keeps your website up and running 24/7. VISIONEFX, a Web design company provides extraordinary web design for businesses throughout the USA. Call: (757) 619-6456 or email info@visionefx.net. for custom web design, Word Press web design, Word Press plugin customization, Search Engine Optimization services.